"Glee" is a new dramedy about lovable losers making it in a typical American high school by banding together in a show choir. So the show's title should be "Show choir" if accuracy mattered most. But that's not a high concept title, so "Glee" it is. So--should you give it a whirl? Yes if you love music--especially pop/rock choral harmony/Broadway stuff. Most of the singing cast--including nearly all the leads--appears to have been chosen for their pipes. Go to YouTube and search on "Don't Stop Believing Glee." If it knocks you out, watch an episode, each of which has several similar numbers. But "Don't Stop Believing" is their best so far, I think, and it should tell you whether you're in the target audience or not. I love Journey's original and their current redo as well, but Glee's version is very strong, and stands in its own right. The performance that goes with it is cute as well. Moreover, several cast members have lead singer-class voices, while others are good but not so good that it seems out of keeping with their characters. Their teacher is also a very good singer. And so are several of his teacher peers (think of the quartet in "Scrubs" that livens up that show's proceedings frequently). I should add that the soundtrack for the show is entirely a capella choir-sung. It's fabulous--by far the best of any current show on TV. I actually like "Smallville's" close-to-grand opera sound track, which is the polar opposite of the light-hearted, unique sound of "Glee." Both achieve their goals. I do have quibbles with some of the numbers--they cover Amy Winehouse's "Rehab" in a way that's appropriate to people who've never needed rehab, so it's right for the story, but in no way captures Winehouse's authenticity. They cover Rihanna's "Give the boy a hand" in a way that I don't think matches the lyrics--and Rihanna's own performance of the song is so nuanced and compelling they needed a boatload of chutzpah just to tackle it. Their version isn't bad, mind you. It didn't make me cringe. But I would have liked it better if I weren't familiar with the original. And yes if you miss "Pushing Daisies." This isn't a fantasy show, but it partakes of the loopy, broad-yet-touching humor of that show (and "Glee" does have fantasy sequences). 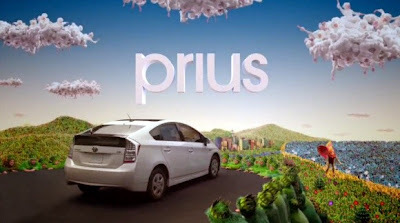 Also yes if you love the new Toyota ads with the a capella, wordless sound tracks and the hordes of dancing children dressed as flowers and clouds and rivers with whitecaps. I know, the plot concept is hackneyed. But as with most everything, execution counts, and this is executed well. It's both uplifting and snarky--a great combo in my book. And the love triangle that's a key plotline is morally complex--none of the three are a "good guy" or a "bad guy." They're like us. That's a breath of fresh air for a Hollywood series. So it's also broad humor and moral complexity. Also yes if you like to see characters who don't all come out the CW network's gorgeous cookie cutter casting bucket. I love looking at beautiful people--after all, I'm genetically programmed that way, just as you are--but if the character is supposed to be not beautiful, it doesn't cut it to just take someone beautiful and do up their hair in a severe bun and park a set of thick glasses on them, all in preparation for the slo-mo sequence later on when the specs come off and the hair comes out to play in glamorous head-tossed shampoo commercial swirls. Here the fat black girl is--who knew?--fat and black. The overdetermined female lead singer of the choir has the Broadway look--not pretty enough for the unforgiving lens of a movie camera, but fine seen at a distance on a stage, given great pipes and the ability to project, and that she's got in spades. The cripple isn't a cripple, but that doesn't show, and he's certainly geeky enough. All the adults in the triangle are attractive enough but not in Brad Pitt/Jennifer Aniston territory (nor, as I said, in CW territory). OTOH, if you don't live for music and find broad comedy exasperating and are a stickler for plot consistency, maybe you won't like it. It's a little over the top, just as show choirs are. And it ain't Shakespeare, nor does it partake of the ashcan school of downbeat realism that produced, for example, "Homcide: Life on the Streets"--which I also loved. A lot of comedy is about people being publicly humiliated, and a little of that goes a long way for me. This has a touch of that, but it's focused more on people with problems actually trying to solve those problems as best they can. It doesn't solve things magically--there's lots of struggle here. But at least it's not hopeless. I'd call the show big hearted. I hope this tells you whether you should watch an episode of "Glee." Or at least listen to the YouTube clips. And I also hope this review doesn't spoil any surprises for you, which I think should be a critic's first principle (like Asimov's Laws of Robotics). The cheerleaders are evil, what a surprise. I think Hollywood producers were tramatized by not being able to score with the cheerleaders when they were in high school and now they're getting back, in their geeky way. And the kids in the glee club are entirely too talented to be realistic. They're supposed to be untalented dorks, instead they seem ready to open on Broadway. And the show implies that the way to success in school and the world is through show business. What a gross disservice to youth! Their chances of success in show business is about like winning the lottery. Also, pretty much everybody on the show is either stupid or mean. It's a mean spirited show. To hell with it.